Parisians and their visitors are in for a treat: for the last time they will get to see the beautiful, individual leaves of the Belles Heures of Jean de France, Duc de Berry, before a valuable piece of their cultural heritage is whisked off once more to foreign climes. The Belles Heures is one of the most beautiful examples of an illustrated ‘book of hours’, a ‘devotional’ book for our devout, God-fearing medieval ancestors who felt like once a week just wasn’t devoting enough time to God, so they ordered manuals with instructions on how to pray better and more regularly at home. 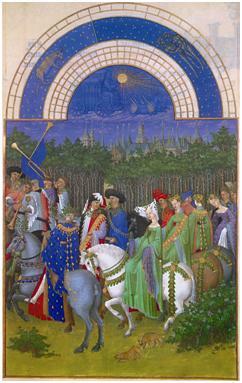 The Limbourg Brothers, Les Très Riches Heures du Duc de Berry: The Month of May, c. 1412-1416. 22.5 x 13.6 cm. Musée Condé, Chantilly. In today’s increasingly secular society, many of us do not have recourse to pray on the hour every hour, unless you count the silent pleas of “please, God, don’t let the bus be late” and the sanctifying “bless you”, nowadays more of an involuntary interjection of politeness than a need to invoke God’s will to protect you from evil spirits or the plague. In the same way, we don’t feel the need to self-flagellate any more, or at least not for religious reasons. Nowadays, more often than not, we check in with Facebook once an hour and share our hopes and dreams in the realm of Twitter. But religious people – never fear! The Belles Heures has its modern day equivalent in iPad apps, though the graphics on tablets are in no way comparable to the stunning beauty of these illuminated manuscripts, “as fresh as the artists left them when they finished their task and cleaned their brushes”. The book is in near perfect condition today, which means Jean de France must just not have been praying enough. It didn’t work out so well for him or the book’s illuminist Limbourg Brothers, as they all died of suspected plague before the age of thirty. There are two weeks left to see the Belles Heures du Duc du Berry at the Louvre, but if you miss the chance you can always catch up with this box-set of books on Medieval Art. Previous Entry Heaven, Hell and Dying Well – Himmel oder Hölle?